My fishing time has been increasing significantly lately. This past weekend I was able to take the new float tube out for a short maiden voyage. The fishing was great but the catching was nonexistent. I am excited to use the tube to exploit the many untouched stillwater opportunities in the area. It will also come in handy on my excursions out west. With the recent unseasonably warm weather has come an excellent response from the fish. 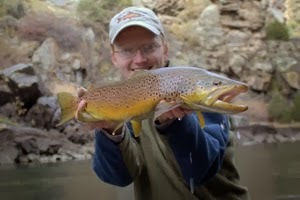 Trout in the mountains are feeding enthusiastically on the bounty now constantly passing in the current. Smallmouth bass are starting to be caught again on the lower elevations of the same streams. This past Sunday found me headed for the Smokies again. My observations from the trip surprised even me. This time of year, the normal routine is for the insects to become active in the middle of the day. Significant hatches tend to start around noon, give or take an hour. The norm has been significantly altered however due to the very warm temperatures we have been experiencing. It appears that the Quill Gordons are just about over now. Naturally a few stray bugs are still emerging but the bulk of the hatch has passed. If my observations from Sunday are accurate, it actually appears that we are in a lull between hatches. Hendricksons have started but are not particularly heavy yet. A random assortment of stoneflies, caddis, and several mayflies are all trickling off but not in consistent all-day action. The midge hatch was actually probably the best of any type of insect I observed, but I was there to fish dries and didn't even feel like dropping a Zebra Midge under my Parachute Adams. Fish are still more than willing to eat a dry...you just have to find the ones that are looking up. The weather featured a bright sunny day which have in turn drove the fish deeper during the middle part of the day. Fishing on Sunday felt much more like mid summer when early and late are the rule to consistent action. The fish that did rise generally did so in the shade although that was not 100% true. One of the highlights of the day was having my license checked by a ranger. I am always glad to see them out patrolling the streams and made a point of telling him that I appreciated his efforts. I hope everyone else will do the same when a ranger or fish and game officer stops by. 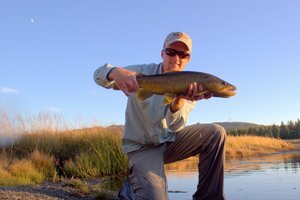 They have a tough job and I notice that we as fly fisherman (myself included) often like to grumble about a lack of enforcement. A little positive feedback can go a long ways towards getting better enforcement and effort from the people responsible for enforcing the fishing regulations. At one point during the day, I spent some time just enjoying the beauty of a mountain stream in early spring through my camera lens. The following are a few of the shots I took. 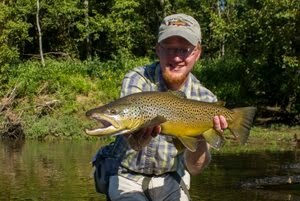 The first picture is of a nice run that produced several rises but all from smaller fish. I took a rainbow and a brown, one near the back, and one at the head of the run. Hi David. Glad the maiden voyage went well or at least you didn't share any difficulties, if you ran into them. Since I started fishing from a float tube, it seems that you have to cruise around and find the school, then you catch fish. Black also seems like the ideal color for lakes and ponds. David, Beautiful fish and absolutely beautiful water! 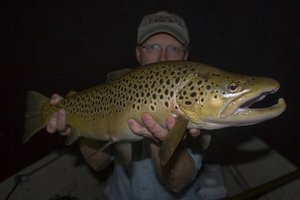 If you're thinking of really becoming a tuber for trout go out and look at the writings of Denny Rickards. Also Brian Chan if you're looking to fish Chironomids. 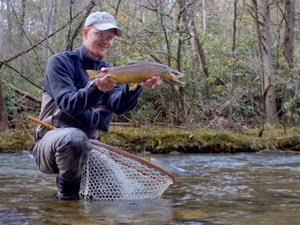 As always I loved reading your blog I was in Deep Creek this weekend caught a few nice ones great pictures! !